As others have noted, Gabriel is an excellent tour guide. He structured the tour to meet our specific requests, including a terrific lunch, and things couldn't have gone better. Even more meaningful than the physical tour was learning Gabriel's thoughtful insights. He not only has a profound grasp of the history of Uruguay and South America, but I suspect he knows more about current events and US history than most Americans! If you're considering a tour in Montevideo, this is your guy. Gabriel was an experienced guide who gave great directions on how to find him from the cruise pier. We were a bit surprised to have both a guide (Gabriel) and driver, which explained why the tour was more expensive than some of the other tours we took. We opted to go the a winery with a tasting, which was fun to try. Gabriel gave us a wonderful tour of Montevideo. He was very knowledgeable about his city, and justifiably proud. We enjoyed our day, and learned a lot. He adapted the itinerary to accomodate our needs. Thank you Gabriel. We had a wonderful tour with Gabriel, we would highly recommend him. There were 27 of us visiting Montevideo and Gabriel was wonderful in showing us around the city. He was a very knowledgeable tour guide. We had a great time. Gabriel was an excellent guide. He was accommodating and able to change itineraries according to our needs. He helped us create a custom tour that included all of the places that we wanted to see. He was very creative because we were in Montevideo on Christmas Day and a lot of places were closed, but he lives there, knows the area well and was able to give us a wonderful tour. He found the only restaurant that was opened and got us in. His English is perfect and he tells the best stories. Thanks Gabriel. We enjoyed the architectural perspective and historic comments. Delightful. This was a great tour (by car), giving us a sense of the history and geography of Montevideo as well as of its Jewish history. We visited a synagogue and school and saw Jewish neighborhoods in the old city and the newer areas. Gabriel was well-informed and helpful, and guided us well! Our first time visit to Montevideo was a real success thanks to Gabriel. He is well experienced and very knowledgeable. His former activities as architect allow him to bring in additional interesting information on the city and its history. While being flexible according to our wishes, he managed to show us a maximum in the given time. We learned so much more than the tour indicated. We loved the walk and lunch. We also took a bus ride and learned how to navigate the system. We saw some beautiful areas of the city and the Pocitos districts. Gabriel was very knowledgable. His English is excellent and his voice carries well in surrounding noise. The tour was well-paced and informative. We appreciated the refreshment stop with bathroom facility. A most delight day spent with a knowledgeable and endearing gentlemen. Very responsive and quick to accommodate. Made the day perfect. Would book with him again in an instant. Van and driver we very professional as well absolutly no complaints. Gabriel was waiting for us (two couples ) when we exited our cruise ship . We had a very informative walking tour of the historic area . Gabriel is a retired engineer and has lived in the city his whole life with his family . We were able to learn so much about the area and his country due to his knowledge. We also took a bus to the beach front area - which was gorgeous. All four of us thoroughly enjoyed being able to experience Montevideo with such a friendly and knowledgeable gentleman. Excellent Tour, Gabriel has a vast knowledge of the city and was very friendly and did an excellent job. Just what we wanted to have, an informative and engaging tour. Gabriel was an excellent guide providing informative details on each of the points of interest. The tour was very well organized and covered a lot of attractions in 6 hours. Fernando was a courteous and safe driver. I would strongly recommend anyone for this private tour in Montevideo. We had a fabulous Montevideo City and Wine Tour with Gabriel. As a Montevideo native and retired Architect, Gabriel was able to provide us with detailed knowledge of his beloved city and country. We visited all of the key monuments as outlined in the tour description. The visit to the Stagnari Winery was one of the highlights of our day. The staff at the winery was extremely welcoming and we thoroughly enjoyed the afternoon. Great wine, food and friends! I highly recommend booking a tour with Gabriel. Wonderful Tour-loved Montevideo and Santa Rosa Winery! Gabriel was did a fabulous job and would highly recommend! Gabriel was very professional and extremely knowledgeable I would highly recommend his services to anyone. Gabriel was an excellent guide - extremely knowledgable about virtually any subject (and we were constantly barraging him with questions). Would strongly recommend him. He is very detail-oriented. Gabriel Cast,our tour guide, treated the four of us as if we were family.Visited the important buildings in the Central district. Plenty of time for photos and we enjoyed Gabriel's informed narrative and his choice of places to see, Plaza de la Armada, the Mercado de los Artesonas, a square block crafts show. A meaningful stop was the Holocaust Memorial , Memorial al Holocausto Del Pueblo Judio, the only one in SA. Lunch near from Gabriel's home was a chance to see Montevideo from a native's view. Gabriel was very knowledgable about not only Uruguay culture and region, provided a memorable day for us. Gabriel, our very personable guide today, was incredibly knowledgable about Montevideo and Uruguay. We were a group of five people with varying interests. He fielded questions on topics ranging from indigenous people, economics, history, vegetation, architecture, local customs, farmers markets and culinary arts (plus many more) with such ease, indepth knowledge and clarity that we were all amazed. If in Montevideo, we would all highly recommend a day with Gabriel! Great tour; he was very accommodating and a wonderful guide. Gabriel was a great guide. Winery was fantastic. Great tour of Montevideo. Gabriel was a fabulous guide. He spoke excellent English, was very personable, and provided excellent insight into the culture and history of Montevideo. We toured with my elderly mother who walks with a cane. Gabriel was very attentive and respectful to this and ensured mom was taken care of. He went at her pace. Highly recommend Gabriel. Thank you, as this was one of our favorite tours! Thanks to Gabriel for showing us Montevideo with such love and passion. Gabriel not only showed us the sights but skillfully explained how the locals live and enjoy the city. He is very proud of his city and is eager to share with visitors. The tour works well for cruise ship passengers as Gabriel is waiting for you right outside the port exit door. We requested to have lunch at a favorite local restaurant and Gabriel selected an outstanding family owned steakhouse that we enjoyed very much. Gabriel provided us an excellent and insightful tour of Montevideo. He brings his own unique experiences from the city to bear which adds personal and historical contexts. Gabriel is delightful, cheery, and knowledgable. We throughly enjoyed our time with him. TOUR GUIDE RESPONSE: Hey Steve, thank you so much for your wonderful review! I also enjoyed sharing the day with you it was fun! I hope you had a great time in Montevideo and also enjoyed visiting Uruguay. I look forward to seeing you back again. Best wishes for the year ahead! Gabriel met us at the hotel, as suggested with a driver. He was very knowledgeable and gave us the tour that we had asked for, jumping in to translate when we needed. He also gave us some tips for restaurants and where to find the best artisan woolens that we were interested in. A great day out! Montevideo was an absolute surprize in a very positive way! Gabriel did a great job of showing off his city. What beautiful coast line which we wouldn't have expeienced without our guide and this tour. Very informative and helpful guide. Couldn't ask for a better experience in Uruguay. Gabriel was an excellent guide. He is knowledgable about the architecture and history of the city. There were 6 in our group and our tour was carefully paced to suit our various abilities. Gabriel was very good at being inclusive of everyone. We really enjoyed getting to know how and where the local people work, shop and relax by walking and riding on public buses. I recently arranged two tours …. 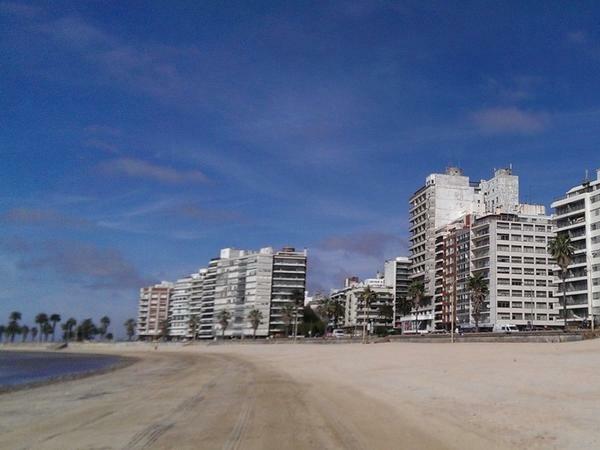 in Montevideo and Punta del Este…. the tour guide was Gabriel C. Both tours were excellent and we found Gabriel to be very well informed, very helpful and willing to go that extra mile. Our tour party rated Gabriel 5 out of 5 and as a result will be recommending your organization to other interested friends. TOURSBYLOCALS RESPONSE: We're so pleased you had a wonderful time with Gabriel, and thank you for recommending us to your travel-loving friends! Gabriel was very attentive to our needs. He was on time, knowledgeable and accessible. We had a wonderful time in Montevideo which he made all the more enjoyable. Gabriel was an excellent host for us and it helped in that he was a retired Architect and I had been in the Architectural business for more than 40 years. He took us to the highlights as well as to the studio/Home of Pablo Atchugarry. Being in the field of the Arts we appreciated this tour. We recommend Gabriel highly as a Guide and potentially becoming a lifelong friend. We hired Gabriel to take a group of 14 of us all over Punta del Este for the day. We also visited a beach on the far south side of town and then eventually had him take us to a wonderful beach restaurant about 40 minutes north of Punta del Este for a late lunch and then finished with some shopping before returning to the ship. Gabriel was on time to meet us and he made the whole day very enjoyable for our group. He speaks English very well and takes him time explaining and interacting with the group. Gabriel provided us with an entertaining, informative and thorough tour of Montevideo. He was professional, friendly and very knowledgeable about the area and Uruguay's history. We loved the wnery tour and tasting too. It was a great day! Gabriel was an excellent tour guide. His knowledge of the city, country, culture plus his very good English language skills made for an excellent day tour of Montevideo. Gabriel arranged for to see everything we wanted. As we specifically requested certain souvenirs Gabriel stopped at a great shop that had all we wanted plus some. It was perfect, a nice quality shop, not a tourist trap. Gabriel es una persona encantadora. Es el guía perfecto. Gabriel did a wonderful job of guiding us around Montevideo. He was punctual, very knowledgeable, has a wonderfully warm personality and being around him was a lot of fun. Highly recommended. I had a fantastic tour with Gabriel! It was like walking the city with a friend I have known a long time. He has great insights into the city and country, the history, the culture, the architecture and other things of interest. He adjusted well to my interests. Very much worth the time and cost! TOUR GUIDE RESPONSE: It was a real pleasure to meet you and spend time with you in Montevideo. Thank you so much for your review, Paul. I discovered a new museum during this tour. I am so pleased you had a nice day and I hope you make it back to Uruguay soon! Gabriel knew a lot about the city. We enjoyed our visit. Gabriel was clearly passionate about the architecture and history of the city. We really enjoyed eating at the local restaurant in one of the neighborhoods outside the main downtown area. Gabriel was very informative and went out of his way to make our tour very enjoyable. Great tour, including the wine tasting and the tapas at the "Corchos"! Comfortable van. TOUR GUIDE RESPONSE: Thank you so much, George! I loved doing your tour. Despite the 'off and on' rain.......Gabriel gave us a great day..and the rain never stopped us from seeing everything! Great van to tour in and a very knowledgeable guide. Gabriel packed a full day of sight seeing..and a nice local lunch! Highly recommend him and his knowledge!!! Gabriel gave us an excellent, well thought-out, and very thorough overview of the city. We were pleased and relieved to see him waiting for us even though our ship docked more than an hour late. This was our first experience with Tours By Locals and we were very impressed. TOURSBYLOCALS RESPONSE: We're happy to hear your first experience with us was excellent! We hope to be able to assist you in future travels. Gabriel is a highly knowledgeable guide and his architectural background adds to the quality of his tour. We had originally booked the walking tour but half way through the heavens opened and during lunch he was able to conjure up an excellent minibus service for our party of six which allowed us to see even more than we had originally planned. We would highly recommend Gabriel. Gabriel was wonderful. He was prompt, professional, and informative. We saw the old city (downtown), entered an Old Sephardic Synagogue (which was disappointing, not well maintained), Holocaust Memorial (small), Artigas Statue, World Trade Center, and walked the mall. He was very aware and helpful with my 85 year old mother. We enjoyed a lunch at one of his local favorites. The city was warm and welcoming and would highly recommend Gabriel. Gabriel was prompt for our rainy day tour. We swung by Casapueblo to view from afar. As we tried to get closer, the crowd of cars and people made us turn back after inspecting the steps leading to the building. We spent more time exploring the city: Mansa Beach, Conrad Casino, Punta del Este lighthouse, Brava Beach "fingers", La Barra wavy bridge, as well as many gorgeous neighborhoods. Gabriel's information was well researched but sometimes confusing (population of area during high season). Worthwhile! A well organized tour and also very interesting. Gabriel was there to meet us as promised, was helpful coordinating with our other travel arrangements, offered incisive and thorough information about the city and the country and he was very well spoken and easy to understand. His knowledge of the city's and country's history provided a complete perspective. Many thanks to Gabriel. I would recommend him to anyone. On time, well organized, very knowledgeable and good English/American language skills. Montevideo in a day has time very well spend with him as your guide. I liked it a lot. Gabriel was our guide in Punta del Este and our entire group of 6 was extremely happy with the tour he provided. Gabriel was very responsive to our group, and helped tailor the tour to our interests. His English was excellent and he was extremely knowledgeable about the area. We were all delighted by our trip to a sculptural garden that was located near the city, and we would highly recommend him as a tour guide. He is good and knowledgeable, very friendly. We had a very good tour of Punta del Este. Hola and Aloha Gabriel! Our Montevideo day tour with Gabriel as our guide, was full of fun, history and excitement. Our Sun Tours Hawaii group of 33 truly enjoyed Gabriel's professionalism, enthusiasm, and knowledge. He planned out a great day with me in knowing what the group wanted to do, needed to see and fulfilled all of our expectations. We really enjoyed Uruguay. I look forward to using Gabriel's services again. We loved Montevideo. It is a beautiful and interesting city with lots to see and Gabriel made sure we saw it all. He added in the sights we requested, didn't mind grabbing a quick lunch from the supermarket and took us to a lovely area to eat by the water. We would highly recommend Gabriel and Tours by Locals. Exceptional tour and everything we could have asked for. Gabriel was terrific. He is knowledgeable and flexible. We totally changed the plan and he was cool with that. We talked about everything and learned a lot: about Uruguay history, about Jewish history in Uruguay, about social attitudes and about architecture (he's trained as an architect). He arranged for an excellent driver as well. Montevideo is a wonderful city and Gabriel gave us a wonderful introduction to it. Highly recommend him. Very Good guide with clear understanding of the city, history and culture.Helpful and patient. We enjoyed Montevideo. we enjoyed our tour with Mikael very much however we were disappointed that he did not take us inside any of the synagogues on the tour. We assumed we were not permitted access but found out after from others who took a similar tour either from the ship or with private guide that they all were taken into some of the synagogues. Considering what we paid for the tour we feel we should have been taken into these sites since it was primarily a Jewish Heritage tour. We had an excellent walking tour with Gabriel, in spite of heavy rain. Gabriel is very knowledgable and personable. He was sensitive to our interests and flexible. We started the tour on foot and then took a bus. Gabriel did a excellent job. Everything was as planned. Gabriel was there waiting for us at the ferry terminal. We walked around Colonia del Sacramento and he was able to tell us many facts about the town. He arranged for us to buy a museum pass to see the small museums in the area. I will give only three stars since he did not seem well-aquainted with the streets. Also, for some reason, we wound up paying for his lunch. We double-checked the receipt. This is the first time we've ever paid for a guide's meal. We didn't want to make a scene and ruin the day. TOURSBYLOCALS RESPONSE: The issues stated in this review were brought up to the guide and the guide's manager attention. The refund for our guide's meal is set to be issued as per our agreement with the customer. Gabriel is an extremely competent, well informed guide. We requested an all day walking tour of Punta Del Este and he gave us exactly what we wanted, he always offered alternatives and sought our opinion on what to do next. Gabriel is very knowledgeable about Uruguay and Punta Del Este, he gave us lots of information on history and culture. We visited the Raleigh Museum and he provided info on the art and sculpture. We had a terrific tour with Gabriel. We enjoyed our tour with Gabriel. His English was excellent and he was extremely knowledgable and competent. He knew his subject matter and provided a comfortable car and a good driver. We had a wonderful day with Gabriel. After a bit of a rocky start because the van was 30 minutes late the rest of the day was great. Gabriel was well informed and a great guide.